Rent villas and apartments in Kučine, Croatia with private pools. Book affordable holiday rentals that are near a golf course. This beautiful holiday home is situated on a hill, in the small village of Kucine. This spacious and tastefully furnished holiday home is located about 5 minutes by car from beaches, golf course, as well as the historical city of Split away. Enjoy many leisure possibilities. The house is located in the natural surroundings of the small village Kucine. The holiday home is simple and functional, with four bedrooms, living room, kitchen and bathroom. This stylishly decorated house is located on the slopes of a hill with panoramic views of the city of Split, the Adriatic Sea and the islands that will leave you breathless. This interesting holiday home is located on a hill and is perfect for families and couples. It consists of 3 levels, which are connected by inner steps. While swimming in the Pool. The beautifully furnished stone house is situated in a quiet village on a hill. It is ideal for a family holiday or a holiday with friends. The comfortable holiday apartment with pool is located on the second floor of a family house. It is beautifully and modernly furnished with two bedrooms. This comfortable, modernly decorated house with a panoramic view of the city of Split and the middle Dalmatian archipelago is ideal for family or friends. This beautiful and tastefully furnished holiday apartment is located in the small place of Kucine near the town of Split. It consists of two bedrooms, bathroom and kitchen with living room. This charming and modern holiday apartment is located on the ground floor of a family house. On the south side of the apartment you can enjoy the morning coffee in the shade surrounded by greenery. This 4-bedroom villa for up to 10 guests is located in Split and has a private swimming pool. With the city of Split only 5km away, you will find Villa Visnja in the Dalmatian village of Kucine. In a peaceful location with beautiful surroundings. 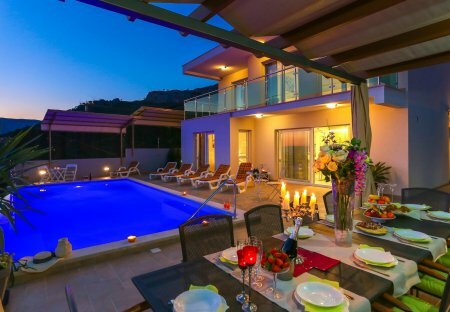 A fully air-conditioned villa with stunning views across the Adriatic, Villa Zelimirka lies 2km from the beach and the centre of Omis. With all the local amenities within easy reach.